How to get the Edge against the Grunfeld. Type: BOOKS. Detail: Sakaev, K. Product Code: 9548782359. Category: OPENINGS QPG. Publisher: Chess Stars. Khalifman says "This book is hghly recommended to all players from club to GM level. 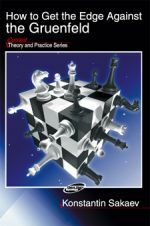 The author studies very popular opening system in great depth and recommends a lot of new interesting ideas. In many variations the analysis is supported bt author's own practical experience". Starting Out: The Grunfeld. Aagaard, J. $20.00.